P.T. Forsyth | When I Survey . . . The Christian doctrine of Atonement has long been a theological preoccupation of mine, which may seem strange since I didn’t come out of an Evangelical background, where this is a central concern. I was blessed to have sabbaticals from the pastorate at three iconic British universities, Oxford, St Andrews, and Cambridge, where I read and wrote about this subject. Out of those experiences came a number of journal articles and this book of essays. I have been heavily influenced by the thought of the British theologian P.T. Forsyth, and many of the chapters in this book focus on his theology. The book was published in 2000 by Pickwick Press, which later became part of Wipf and Stock Publishers, who re-issued the book in 201o, for which I am grateful. It is a humble little book that traces my attempt to come to grips with this vexing doctrine. It has an extraordinary foreword by the estimable Gabriel Fackre, which I think alone makes the book worth having. Wipf and Stock is currently having a 40% off sale until May 1, so if you are interested in obtaining this book, now is the time. You can go to the link here. I have written before about my mixed feelings about the “professionalization” of the clergy. The relationship was once more like a marriage covenant than a job. Lately I notice more and more that the relationship between clergy and congregation is construed as a contractual one borrowed from the corporate world. And I also note with sadness that this model is at the heart of much clergy/congregation conflict when one or both parties feel aggrieved that the contract is not being properly carried out. A covenant has room for forbearance and forgiveness; a contract does not. When I was ordained, the preacher (Dudne Breeze) admonished me to be a minister of the Word of God. He didn’t admonish me to be the CEO or the COO, or even to be a faithful employee of the congregation. My job I knew was not to make the congregation flourish but to make the Gospel real. There were times in my ministry when I had to stand against the majority will of the congregation on behalf of the Gospel. This is no fun when you have come to love your congregation. Years ago I came across this great letter that P.T. Forsyth (1848-1921) wrote to his new congregation in Cheetham Hill, England. He made it plain that although they had called him he had a prior and higher call. Can you imagine a beleaguered pastor saying something like this today to an angry board of trustees? The church could user fewer employees and more ministers.. 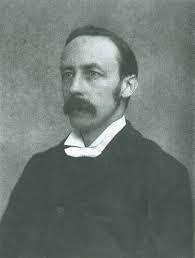 Happy 163rd birthday, P. T. Forsyth! It is not every week that one gets to celebrate the back-to-back birthdays of one’s two favorite theologians, but this is the time. Yesterday we raised a glass to Karl Barth’s 125th birthday and today we raise a glass to P.T. Forsyth on his 163rd birthday. Who was P. T. Forsyth? Peter Taylor Forsyth was born in Aberdeen, Scotland on this day in 1848 to a family of modest circumstances, educated there through his university years, spent a semester studying in Germany, and became a Congregationalist minister serving in five successive congregations in England. At the turn of the 20th century he became principal of his denominational college in London and proceeded to produce 25 books and hundreds of articles until the time of his death in 1921. Like Karl Barth his theology was hammered out on the anvil of weekly preaching and pastoring. But he identified the inherent weakness of the human-centered “theology” that prevailed in his time (and dare I say ours) two decades before Barth. Not everything he wrote translates to our time, but his writings reflect his deep love for the Gospel and his prescient insights in what that Gospel might mean for all manner of human endeavors. At the heart of his thought is the “work of Christ”, what God has done for us that we cannot do for ourselves in the atoning cross of Jesus Christ. Understanding the love of God as “holy love” he called into question the flabby religious sentimentalism of his time in the name of the God who takes sin and evil seriously and has acted to overcome it. He is not a household name in the theological world, and he has had scant attention by the academy, but preachers of all stripes know and love his writings. We give thanks to God for him and his labors on behalf of the church on this his birthday. I ran across this passage in P.T. Forsyth’s Work of Christ in which he parses the issue quite clearly and cleverly, making no mistake that the “work” is finished, but also referencing the role of the Holy Spirit in the church. “You are afraid of God,” you hear easy people say; “it is a great mistake to be afraid of God. There is nothing to be afraid of. God is love.” But there is everything in the love of God to be afraid of. Love is not holy without judgment. It is the love of holy God that is the consuming fire. It was not simply a case of changing our method, or thought, our prejudices, or the moral direction of our soul. It was not a case of giving us courage when we were cast down, showing us how groundless our depression was. It was not that. If that were all it would be a comparatively light matter. If that were all, Paul could only have spoken about the reconciliation of single souls, not about reconciliation of the whole world as a unity. He could not have spoken about a finished reconciliation to which every age of the future was to look back as its glorious and fontal past. In the words of that verse which I am constantly pressing, “God was in Christ reconciling the world unto Himself.” Observe, first, “the world” is the unity which corresponds to the reconciled unity of “Himself”; and second, that He was not trying, not taking steps to provide means of reconciliation, not opening doors of reconciliation if we would only walk in at them, not labouring toward reconciliation, not (according to the unhappy phrase) waiting to be gracious, but “God was in Christ reconciling,” actually reconciling, finishing the work. It was not a tentative, preliminary affair (Romans xi. 15). I am struck by the last line. Would that more people would learn how to behave properly in the Church! I always thought it was a behavioral issue, but apparently it is a theological one as well. We can see here that Forsyth’s theology focuses on God as a personality, as one who acts, who is best understood not for who he is but rather for what he does, therefore not in metaphysical but moral categories. So in Forsyth’s theology a two–nature Christology is replaced by a two–act Christology, with an act from the divine side and a corresponding one from the human side. The divine kenosis, or self-emptying, coincides with the plerosis, or self-fulfillment, of Christ. In the late nineteenth century Kenotic theories of the atonement had been popular among German Lutherans (ie. Gottried Thomasius, W.F. Gess, F.H.R. von Frank) and with some British Anglicans, notably Charles Gore who gave the Bampton Lectures at Oxford in 1889. Kenotic views of Incarnation or Atonement put forth the idea in one way or another that, in Christ, God relinguished some aspect of his divinity. The kenotic approach was criticized for a number of reasons: that it was pantheistic, blurring the line between God and humanity; that it undermined the doctrine of divine immutability; that it jeopardized the Trinity, for a humanized Son empty of divine attributes could be no part of the Trinitarian life; that it failed to recognize the proper relationship between divine existence, divine attributes and divine essence when it claimed the former can be separated from the latter; and, finally, that the kenotic Christ is neither God nor Man and therefore doesn’t solve the problem it sets out to solve. The popularity of the kenotic approach was already waning by Forsyth’s day. This he no doubt knew, as well as the criticisms and difficulties. 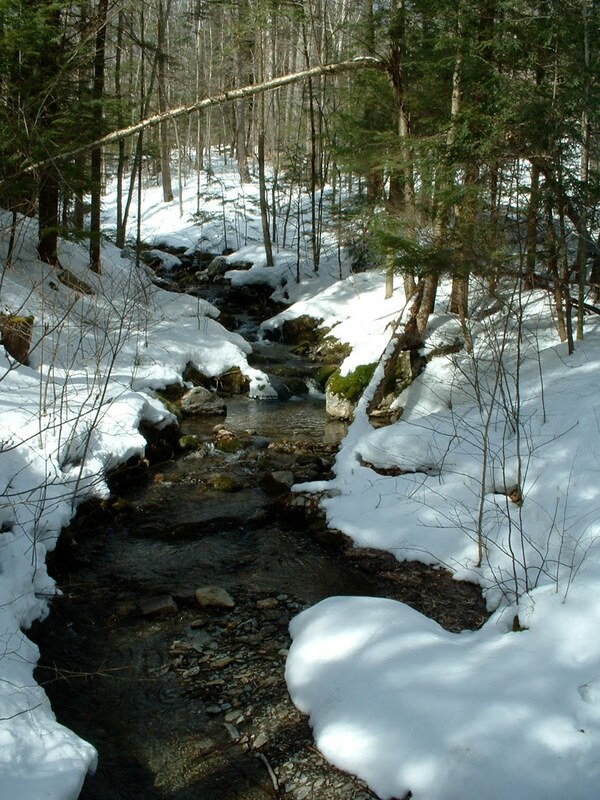 “Many difficulties arise readily in one’s own mind” he wrote, “It is a choice of difficulties.” (The Person and Place of Jesus Christ, 294) He takes pains in places to separate himself from some of the more vulnerable of the kenoticist’s views. One of the traditional objections to a kenotic theory is that if the divine nature is given up how can the subsequent human act be an act of God and therefore a saving act, since only God can save? But Forsyth’s view of kenosis doesn’t involve the loss of divinity so much as its self–retraction or self–reduction. This is language about a free personality who chooses to act and is known by his acts, rather than language about a deity known by his attributes. An important passage for Forsyth is Matthew 11:27: “All things have been handed over to me by my Father; and know one knows the son except the Father, and no one knows the Father except the Son and anyone to whom the Son chooses to reveal him.” (The Person and Place of Jesus Christ, 81) He cited this text against liberal critics to show that it was not just in the Gospel of John but also in the Synoptics that a high Christology was present. He argues that pre-existence is not some add–on to the Gospel, but an intrinsic feature of the Christ who is God. He gives a series of examples of how a personality might freely choose to limit himself: a wise vizier to a foolish young sultan who voluntarily takes a cup of poison meant for his master and dies a prolonged and debilitating death; a musical genius in Russia who knowingly chooses to dedicate himself to political associations that cause him to be deported to a life in Siberia where he can never play the violin again; a university student brilliant in philosophical pursuits who, upon the death of his father, gives up his career to take over the leadership of the family business. (The Person and Place of Jesus Christ, 296–298) In each case a conscious choice, motivated by love, is made which limits the personality. In each case, something precious is lost, but more is gained, and love is the motivation of each choice. So it is fitting that “at the name of Jesus every knee should bend, in heaven and on earth, and under the earth, and every tongue confess the Jesus Christ is Lord, to the glory of God the Father.” (Philippians 2:10,11 NRSV) Here in praise and confession are represented the whole of creation according to the cosmology of the day. The moral struggle that Christ was involved in was the struggle to be obedient to the Father’s will. It is the struggle to become a servant. What does Christ’s becoming a servant mean? It means that he took on a state of subjugation in which he was called upon to render obedience. What Christ becomes by his kenosis is a servant, and it is the free moral act involved in his obedience to the Father’s will that is decisive for his Lordship. Schamyl was the great religious and military leader of the Caucasus who for thirty years baffled the advance of Russia in that region, and, after the most adventurous of lives, died in 1871. At one time bribery and corruption had become so prevalent about him, that he was driven to severe measures, and he announced that in every case discovered the punishment would be one hundred lashes. Before long a culprit was discovered. It was his own mother. He shut himself up in his tent for two days without food or water, sunk in prayer. On the third day he gathered the people, and pale as a corpse, commanded the executioner to inflict the punishment, which was done. But at the fifth stroke he called, “Halt!” had his mother removed, bared his own back, and ordered the official to lay on him the other ninety-five, with the severest threats if he did not give him the weight of each blow. How would we assess Forsyth’s kenosis/plerosis proposal? Its purpose is twofold: 1. to safeguard the full humanity of Christ against a docetic view, and 2. to assert against liberal theology the full participation of Christ in the Godhead. If doctrine is the conceptual redefinitions of the biblical narrative than Forsyth has tried to keep scripture clearly in view. He depicts Christ as one engaged in a mighty moral struggle, freely acting finally in obedience to the Father’s will at the expense of his own life. The human struggle is not passed over lightly, yet the whole action is seen as an act of God. Forsyth’s captures this uncertainty and the powerful moral drama that is the passion. There is great rhetorical power to Forsyth’s theology as he addresses issue after issue returning always to the cross as the center. Forsyth speaks of the subordination of Christ to the Father, risking subordinationism, although his other statements make it clear he does not believe by this in the Son’s generation from the Father. Again Forsyth is more concerned with the describing the flow of God’s activity in the biblical narrative than with metaphysical assertions, and by the standards of Nicene orthodoxy, even the New Testament itself is subordinationist in tendency. If “doctrine is the conceptual redefinition of the biblical narrative” (Frei) then has Forsyth done justice to the biblical narrative? 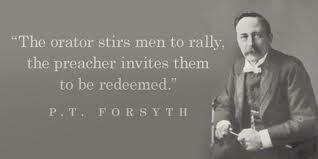 Here, too, Forsyth has been successful for he has successfully kept Scripture clearly in view throughout. He deals with both the high Christology of John and the epistles and the human Jesus of the Synoptics, the one who went through the full experience of the pas-sion. Donald MacKinnon wrote that “the realities of Gethsemane refuse to allow him (Forsyth) to neglect the extent to which the passion was suffused by a kind of terrible uncertainty” (Hart, Justice the True and Only Mercy, p. 108). Forsyth’s captures that “terrible uncertainty” and the powerful moral drama that is the passion. There is great rhetorical power to Forsyth’s theology as he addresses issue after issue returning always to the cross as the center. In The Person and Place of Jesus Christ he offers a highly nuanced theological interpretation that tries to make sense of the meaning of the cross. His kenotic Christology attempts to explain the mystery of the incarna-tion and the inner workings of the atonement without using the metaphysical language of which he was so suspicious. Both Donald MacKinnon and Colin Gunton have criticized Forsyth for eschewing metaphysical language, particularly ontological language, and for his too easy dismissal of the truths of Chalcedon. I have to agree in part with Colin Gunton’s charge that Forsyth imported a metaphysic through the back door; after all, when you talk about “modes of being” you are pretty close to metaphysics if not already there. Gunton is right when he says: “Forsyth’s kenotic the-ory of the incarnation . . . . is essentially an attempt to make logical sense of the incarnation conceived as something that really happened in human history. It thus belies his pro-claimed lack of interest in metaphysical theories” (see Gunton’s critique of Forsyth in Yesterday and Today, pp. 168- 173). Having acknowledged the charge, let me say that I think Forsyth’s attempt to articulate a Christology outside the usual metaphysical framework is part of what gives his writings such rhetorical punch and dramatic power. He is a good theologian, but he never stops being a preacher, which may account for his continued popularity with preachers. Yet, unlike at least some interpretations of the Yale School, he insists that the Gospel is more than a cultural-linguistic narrative which sets norms for a community, the church. For Forsyth it is also God’s truth for the whole world. In this he remains decidedly evangelical, and his hermeneutic has an important experiential dimension. But this is not just any experience! Forsyth would have under-stood “experience” more along the lines of Jonathan Ed-wards’ view of Christian experience than that of those to- day for whom autonomous personal or group experience is authoritative. He would have had little use for the idea of “re-imagining” God in light of our experience. “See to the Gospel,” he said, “and experience will take care of itself.” For Forsyth it is not human religiosity that matters. Rather, the primary actor in the drama of human redemption is al- ways God in Christ, known chiefly by his great act on the cross. The Atonement in Modern Religious Thought. New York: Whittaker, 1901. The Cruciality of the Cross. London: Independant Press, 1948.God the Holy Father. London: Independent Press, 1957.The Person and Place of Jesus Christ. London: Independent Press, 1948.The Preaching of Jesus and the Gospel of Christ. Blackwood, South Australia: New Creation Publications, 1987. The Work of Christ. London: Hodder and Stoughton, 1910. (This is the original paper that I presented at the United Reformed Church Centre at Windermere, England in May of 1998, at a conference: P.T. Forsyth: Theologian for a New Millennium. It was gathered with the other papers into a book by the same name edited by Alan P. F. Sell. It later appeared also as a chapter in my book When I Survey the Wondrous Cross: Reflections on the Atonement. Pickwick, 2000, Wipf and Stock, 2010.